in Fig. 44. Light from a source s falls on the revolving mirror R, and by means of a lens L forms an image of s at the surface of a large concave mirror JH- The light retraces its path and forms an image which coincides with s if the mirror R is at rest or is turning slowly. When the rotation is sufficiently rapid the image is formed at sx, and the displacement s*?! is readily measured. If the distance LM is occupied by a column of water, the displacement would be less if the velocity of light is greater in water than in air, as it should be according to the corpuscular theory; and if the undulatory theory is correct, the displacement would be greater. Foucault found the displacement greater, and thus the corpuscular theory received its death-blow. 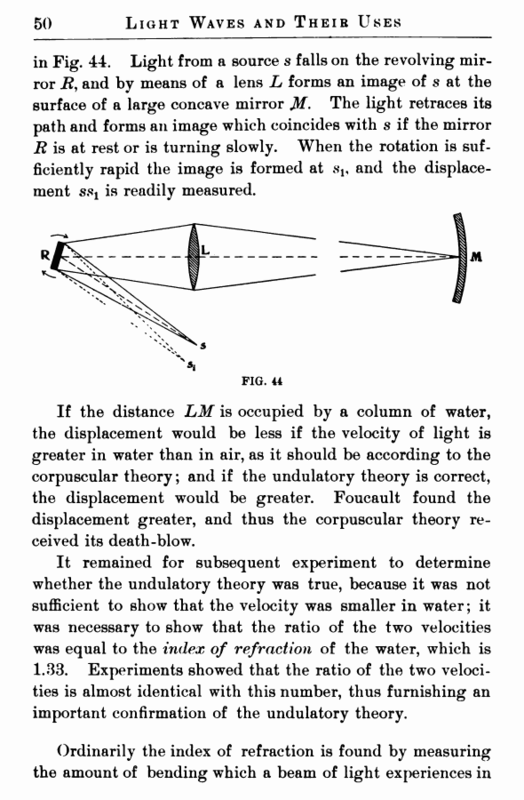 It remained for subsequent experiment to determine whether the undulatory theory was true, because it was not sufficient to show that the velocity was smaller in water; it was necessary to show that the ratio of the two velocities was equal to the index of refraction of the water, which is 1.33. Experiments showed that the ratio of the two velocities is almost identical with this number, thus furnishing an important confirmation of the undulatory theory. passing from air into the medium in question. But if this number is identical with the ratio of the velocities, the index would evidently be determined if we knew the ratio of the wave lengths, since the wave lengths are also proportional to the velocities. This can be obtained by the interferometer. 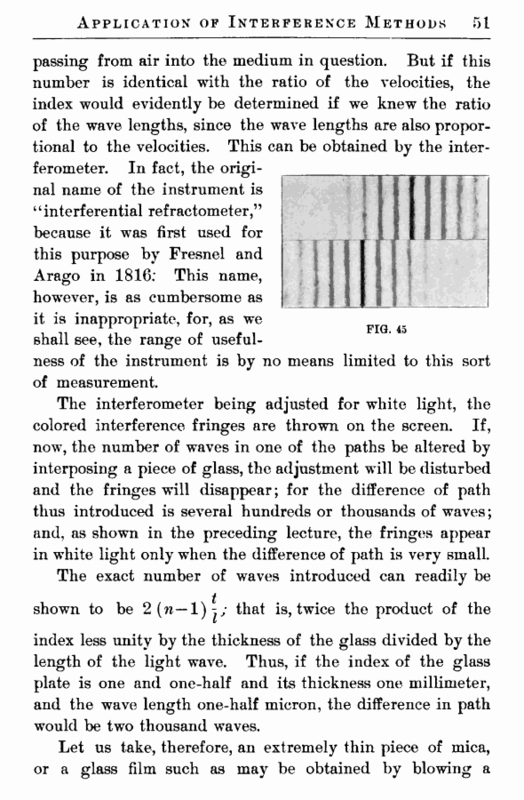 In fact, the original name of the instrument is ‘ ‘ interferential refractometer,” because it was first used for this purpose by Fresnel and Arago in 1816: This name, however, is as cumbersome as it is inappropriate, for, as we shall see, the range of usefulness of the instrument is by no means limited to this sort of measurement. The interferometer being adjusted for white light, the colored interference fringes are thrown on the screen. If, now, the number of waves in one of the paths be altered by interposing a piece of glass, the adjustment will be disturbed and the fringes will disappear; for the difference of path thus introduced is several hundreds or thousands of waves; and, as shown in the preceding lecture, the fringes appear in white light only when the difference of path is very small. index less unity by the thickness of the glass divided by the length of the light wave. Thus, if the index of the glass plate is one and one-half and its thickness one millimeter, and the wave length one-half micron, the difference in path would be two thousand waves.